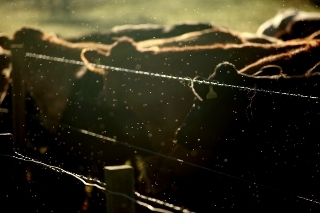 Share "Tips On Fly Control For Your Cattle"
Every year spring brings new beginnings. The sun shines, livestock begin to breed, and the grass begins to turn green again. With all that beauty also comes some disadvantages. The one disadvantage you should be aware of is fly season. Flies can torment your cattle and drain profits in pastures all over the nation by causing them to lose weight and not produce milk. The reason why flies surround and invade cattle so much is because the manure cattle leave behind is a prime breeding ground for flies to lay eggs. During the summer months, this will only create a never ending cycle of flies being born and harming your livestock if the proper measures are not taken. There are a variety of flies that use cattle as hosts. These flies are horn flies, stable flies, face flies, and horse flies. Out of all these species, the fly that matters the most is the horn fly. The reason why horn flies are the only ones that matter is because they are the only fly species that hangs around long enough for any kind of insecticide to do any good. The other fly species don't stay in contact with the cattle long enough for any current control method to be effective. Horn flies will bunch up in a mass and torment your cattle until they are no more. They can also travel quite a distance and swap to different hosts meaning that you and your neighbor can swap flies. 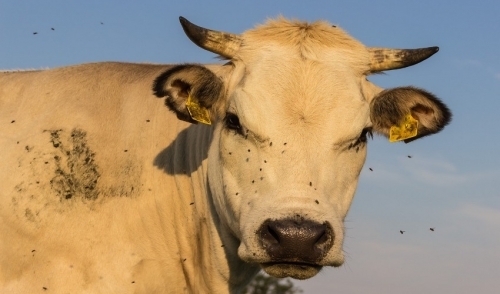 So as you are gearing up for the battle against the flies, consider these tips and options on fly control for your cattle. One way to control flies is to practice good housekeeping and change the hay frequently. The hay residue left behind from bales being shuffled around constantly in combination with the manure from the cattle creates the ideal habitat for the fly larvae. Therefore clean up old hay and manure as much as possible to prevent the horn flies from having any options to lay eggs. Good housekeeping won’t completely solve your fly problem, but it will help your cattle live easier and reduce fly pressure. The other way to control flies is to use insecticide. There are many types of insecticides including ear tags, pour-ons, and spray-ons. Insecticidal ear tags and pour-ons are still among the top choices for horn-fly control. However, be mindful that the lifecycle of flies does not always coincide with the work cycle of cattlemen. If applied too early, that season of flies can become resistant to your insecticide. The final way to control flies is to use feed through products like Clarify or Altosid IGR. These can be a bit more expensive but offer a significant ROI. Feed through products are supplements that prevent adult flies from developing in and emerging from the manure of treated cattle. This method can attack the insects’ nervous system and interrupt its life cycle so that it reduces the number of flies in existence around your cattle. The only downside to feed through programs is that they only attack larvae and prevent new flies from growing. Continue to use ear tags and spray-ons to reduce adult flies. The key to fly control is to know your enemy and understand how to put it down. If you see flies tormenting your cattle and causing you to lose money, follow these tips to kill the enemy and restore your cattle.